By Seizing E-Commerce Website Silk Road 2.0, the FBI Provides Protection for Violent Drug Cartels? The FBI successfully provided protection for violent drug cartels today by seizing the peaceful e-commerce website Silk Road 2.0. This feat was accomplished because “at least one undercover law enforcement agent” helped start the shop and run it for a year. A year after the Silk Road 2 came online promising to revive the Dark Web drug trade following its predecessor’s seizure by the FBI, the sequel has suffered the same fate. On Thursday international law enforcement agencies including the FBI, the Department of Homeland Security and Europol took down the Silk Road 2 and arrested its alleged operator 26-year-old Blake Benthall in San Francisco. Benthall, who is accused of running the new Silk Road under the handle “Defcon,” has been charged with narcotics trafficking, as well as conspiracy charges related to money laundering, computer hacking, and trafficking in fraudulent identification documents…. …The criminal complaint against Benthall outlines how the Silk Road 2′s staff was infiltrated by at least one undercover law enforcement agent even before the site went online in November of last year. In May of this year, the FBI somehow pinpointed the foreign server that ran the Silk Road 2 despite its use of the anonymity software Tor to protect its location, and obtained records from the server’s hosting provider identifying Benthall. 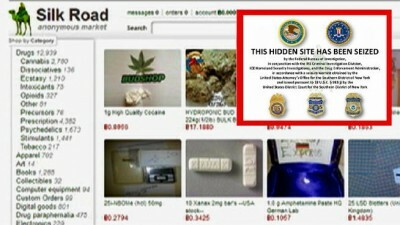 Hosted on the dark web Silk Road 2, like its predecessor, provided a safe platform for anonymous strangers to buy and sell drugs that are prohibited by governments. Instead of meeting on dark street corners or in some filthy drug den, people now had the opportunity to buy drugs (and learn about drug safety) from the comfort and security of their living rooms. Drugs will always exist in society, so by banning them lawmakers are making the active decision to distribute them through violent gangs. Anonymous dark web commerce like Silk Road solved the problem of violence in the drug trade. Unfortunately, prohibition is the justification for much of the FBI’s budget and its reason to exist. By having at least one agent as a founding contributor to Silk Road 2.0, they engaged in the exact crime they are now charging this 26-year-old techie with. That makes them worse than accomplices. And when they’re not helping form honeypot drug markets, they’re incubating fake terror plots to justify that part of their budget. Their actions in the drug war and war on terror have created far more victims than they could ever possibly “save” with these tactics. It’s time we recognize that the FBI is a violent mafia gang who’s mostly out to protect its own interests.